Located on the east coast of Oahu, 20 miles (32 kilometers) north of Honolulu, Tropical Farms Macadamia Nuts is set in the shadow of the mountains of the Koolau Range and is a stop on many circle-island tours. It’s a great place to enjoy a Hawaiian treat and shop for gifts and souvenirs. Along with macadamia nuts, Tropical Farms sells coffee, chocolates, gift baskets, and other local items. The rustic indoor-outdoor complex is a nice break when you want to stretch your legs on a drive around the island, whether you make the journey yourself or as part of a circle-island tour from Waikiki or Honolulu. Tastings are typically provided for coffee and different varieties of macadamia nuts, such as cinnamon- or Kona coffee-glazed, and tours are available into the orchards. Cracking the raw nuts is a favorite with kids. Circle-island tours that include a stop at the farm typically last from six to 10 hours, as many other stops are also made. Kamehameha Highway is a 2-lane road on this part of the island, and it’s the only way to get from north to south along the east coast; delays are possible. 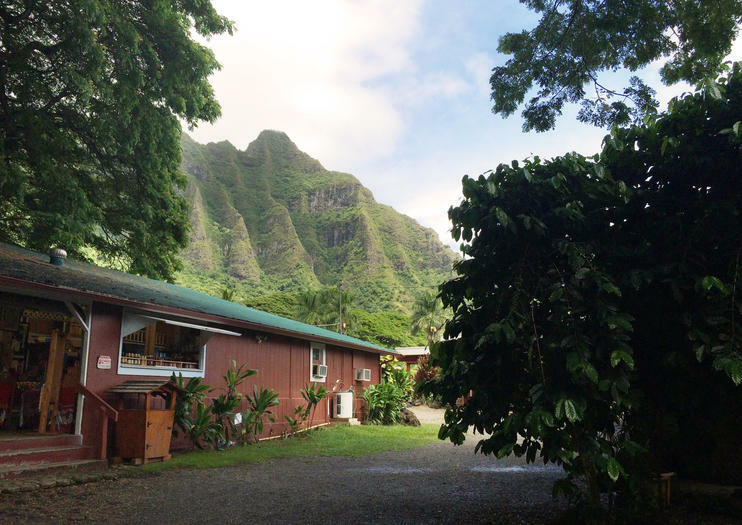 Tropical Farms is located about a mile down the road from popular Kualoa Ranch, making it easy to visit both in one day. Tropical Farms is located on the Kamehameha Highway, one of Oahu’s major roads, which runs along the east coast, across the North Shore, and through the center of the island, making the farm easy to get to by car from Honolulu, Kailua, and the North Shore. By public transit, bus 55 stops near the farm entrance. The store is open daily (except major holidays), from morning to early evening. To experience smaller crowds, go in the morning before most groups arrive. Known for its outdoor adventure opportunities and movie filming locations, neighboring Kualoa Ranch is one of the most visited attractions on Oahu outside of Honolulu. ATV tours, horseback rides, and a zipline course provide ways to admire the green mountain scenery, and the movie tour shows you where blockbusters such as Jurassic Park have been filmed. Tour all of Oahu in one day! This circle-island tour drives you to some of the best views on the island, with stops including Diamond Head Crater, the healing Makapu’u Pool, Kualoa Beach Park and Puaena Point - to name a few. On top of that, your day will be filled with five different meal and snack stops, allowing you to taste some of the island’s best flavors. Enjoy traditional Hawaiian food like poi and Kalua Pig at Waiahole Poi Factory, sample macadamia nuts and coffee at the Macadamia Nut Farm and more! Last but not least, the tour gives you the important chance to connect to true Hawaii through a spiritual visit to Kukaniloko Birthstone State Monument. Make the most of your time in Hawaii and take a day to taste, see and feel it all! Enjoy this amazing tour with a private company of loved ones and other photography enthusiasts alike, explore and capture every shade of Hawai'i from early morning to a fiery sunset.No other tour will provide such an abundance of breathtaking sights in one day.Let us guide you through an amazing 12-hour circuit of Oahu covering all major sights and a few more hidden ones!Explore over 25 locations around the island, capture an eagles eye view of Makapu'u Beach, gaze upon lush green valleys from jaw dropping cliff's where ancient Hawaiian battles took place, and see magnificent sea turtles resting on the famous beaches of North Shore with daring surfers taking on monstrous waves.Along the journey explore and learn about Hawaiian culture and it's rich and colorful history from our knowledgeable guides and become an expert at photographing Hawai'i. Circle the island of Oahu and its many points of interest on this guided, 6-hour adventure. Learn about Hawaiian history and culture while exploring the coastline. Visit sites like Diamond Head, the Pali Lookout, Chinaman’s Hat and Laie Point. Also, see famous places like Banzai Pipeline, Sunset Beach and Waimea Bay. For lunch, try some fresh Hawaiian shrimp from one of the local food trucks. And if time permits, check out some of the secret spots for viewing sea turtles and monk seals. Waikiki hotel pickup and drop-off included. Get personalized attention and a flexible itinerary on this full-day private tour of Oahu. Travel in a private van, stopping at the island's highlights and spending as much or as little time as you like at each stop. Pickup and drop-off from Honolulu and Aulani/Ko Olina accommodations.